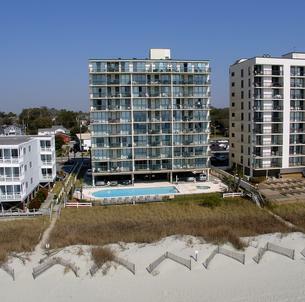 Come enjoy the oceanfront and warm sandy beaches at Emerald Cove I in North Myrtle Beach, South Carolina. Choose an oceanfront, four-bedroom North Myrtle Beach condo rental for your relaxing stay in North Myrtle Beach, South Carolina. You can comfortably stay with up to 10 members of your family or 10 of your closest friends in each of these condos in North Myrtle Beach, South Carolina for a great time at this North Myrtle Beach resort that won’t be forgotten. Emerald Cove I is conveniently located in the Windy Hill section of North Myrtle Beach, South Carolina where you will find endless fun and unlimited relaxation at your stay in this outstanding North Myrtle Beach resort. Emerald Cove I is a North Myrtle Beach resort that is located just off of 43rd Avenue South, an easy 25-minute drive from the Myrtle Beach International Airport and an easy drive to unlimited North Myrtle Beach entertainment and Myrtle Beach area excitement. During your North Myrtle Beach vacation at Emerald Cove I, you can feel safe and relaxed with your car parked in the covered garage and enjoy miles of family friendly beaches. From your fabulous oceanfront, four-bedroom North Myrtle Beach vacation rental it’s only a short walk until your feet are in the North Myrtle Beach sand, breathing in the fresh salty air. Enjoy some family fun when you build a large sandcastle fit for a king or search the beach for seashells that are half buried in the sand. It’s easy to work on your perfect tan while you enjoy a glass of Southern sweet tea and lose track of time watching the waves crash on the shore. During your stay at the North Myrtle Beach resort you can also enjoy the sound of the Atlantic Ocean and the warmth of the sun by relaxing in a poolside lounge chair. The swimming pool at this North Myrtle Beach resort is located right outside of the Emerald Cove I North Myrtle Beach resort. The swimming pool is on the beach side of the resort with easy access to the beach. This large pool with crystal clear water has room for everyone and we know the whole family will enjoy it. While staying at Emerald Cove I in North Myrtle Beach, South Carolina you will see that there is easy access for an unlimited amount of family fun. Windy Hill is a section of North Myrtle Beach, South Carolina that provides a unique shopping and dinning experience at Barefoot Landing, which is only a mile from your North Myrtle Beach resort. At Barefoot Landing you will find unique boutiques for that perfect souvenir or gifts to take home from your North Myrtle Beach vacation. Barefoot Landing is located on the Intracostal Waterway and provides relaxing sites and a refreshing breeze.